Today’s market is swamped with Indoor Positioning providers, all using different technologies and hardware. As a customer, keeping track and making a decision on which provider to choose can become quite a challenge. We’re here to help, so here are the top 10 reasons why you should use indoo.rs! Most companies will probably claim the very same. However, our company was established in 2010, when Indoor Positioning was still in its infancy. We have been there from the very beginning and gained vast experience in the field over the years. Comprised of a dedicated team of experts, indoo.rs has secured its position at the forefront of the industry by delivering accurate results, continuously improving with the most innovative technologies used. Have a look at our customer section, to see which big and global players also trust in our solutions. Despite our position at the forefront of the Indoor Positioning industry, we don’t just stop there and rest on our laurels, we continuously strive to improve ourselves and contribute to a user friendly technology and highly accurate solution. If you want to be the best, a healthy drive for change and innovation is indespensable in this industry. The map on the left was created using Fingerprinting recordings. 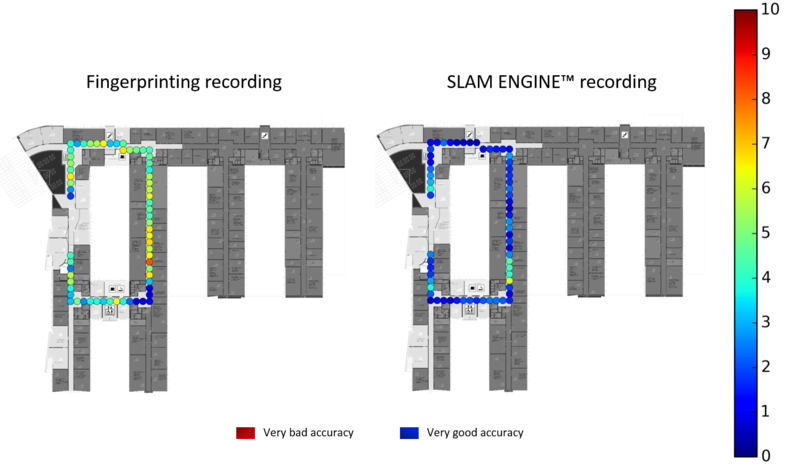 The one on the right uses our sophisticated technology (SLAM) to take accurate recordings. From the colour codes (red=bad accuracy, blue=good accuracy), you can see that accuracy on our SLAM map outdoes the other one easily. Our customer is king! We’re always doing our best to make your indoo.rs project special and not only provide you with the best possible Indoor Positioning system, but also support you all the way through with our Professional Services. From ordering Beacons to setting up the Indoor Positioning system on site in your building, we offer the full service package. No need to worry about anything, we’ll get it done for you. indoo.rs provides automated floor recognition. This means that while navigating, your map and route will automatically switch to the next floor once you have reached it. The same applies to transition between indoors and outdoors. Once you step outside, GPS will take over to help you navigate, and vice versa. That way you can easily navigate to the exit of the building and once outside, navigate to your car on the parking lot. One of the most frequently asked questions we find ourselves confronted with is whether you require an internet connection while using our services. The answer is no. Neither while setting up the system, nor as a user while navigating the unexplored indoors. Speaking of FAQs, we’d like to take the chance to also clarify another myth, i.e. due to Beacons usage, your smartphone would run out of battery faster than usual. This is not the case. As we are using Bluetooth Low Energy Beacons, it will only consume a minimal amount of your phone’s battery life, so you will hardly even notice it. Although we do provide a full service package, including app development, if you have the capacity and know-how, you can of course also do it yourself. So if you are an app developer, you will have easy game with our SDK, whichcan be integrated into any existing app. You won’t need a third party in order to make indoo.rs work. We want to reach as many people as possible, who can use our services, without compromising on quality for our products and services. Therefore, we have dedicated developers who work hard to deliver the best possible SDK for both worldwide leading platforms, Android and iOS. You can’t always have it all. indoo.rs however gets pretty close by providing a holistic Indoor Positioning solution, which includes all possible features to use the software in any imaginable way. While some competitors may stop at Indoor Navigation and Routing, indoo.rs goes much further by providing a Visually Impaired Navigation solution, Asset Tracking, Analytics and a Beacon Infrastructure Management Platform. Despite this broad spectrum of use cases and solutions, we can proudly say that we manage to maintain our high quality standards and keep our position at the forefront of the Indoor Positioning and Navigation industry. While technology is steadily advancing, bringing huge improvements and conveniences to us, people with special needs are often forgotten about. Indoor Navigation on smartphones is a great solution if you have normal sight, however, how do people with visual impairments benefit from this innovation? 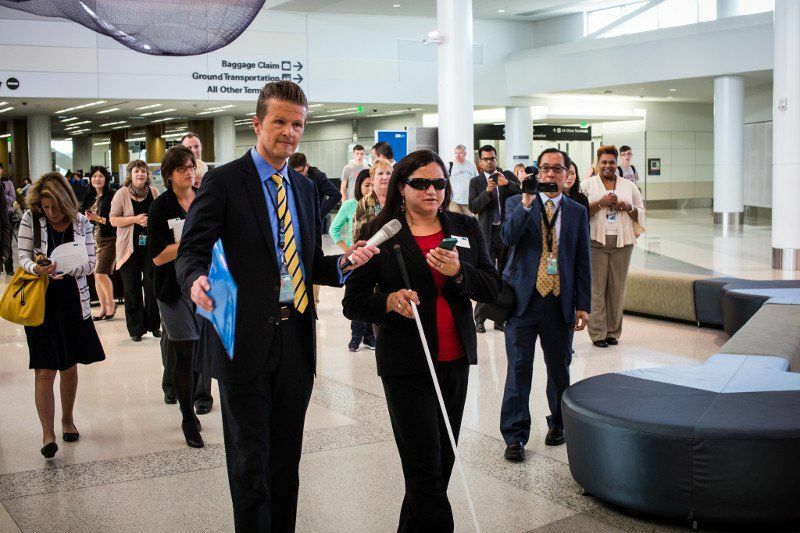 Since showing the route on the phone’s map in real time is not enough in such a case, indoo.rs developed a special app which works with an audio guide to give blind users verbal directions. This gives them a much more detailed understanding of their surroundings, helps them navigate unknown indoor venues independently and thus also boosts their self-confidence. Knowledge transfer is one of the aspects we think of as essential to bring the idea of Indoor Navigation to a broader audience within a smaller timeframe. To achieve this, we do not only send out our engineers to help you put your plans into action, we also provide trainings for you and your employees, which will give you the competency to perfectly set up the Beacon infrastrucuture and create a digital map of your building on your own. You will be educated to become an expert for setting up a complete Indoor Navigation system and can easily pass on this knowledge to your own customers as well.